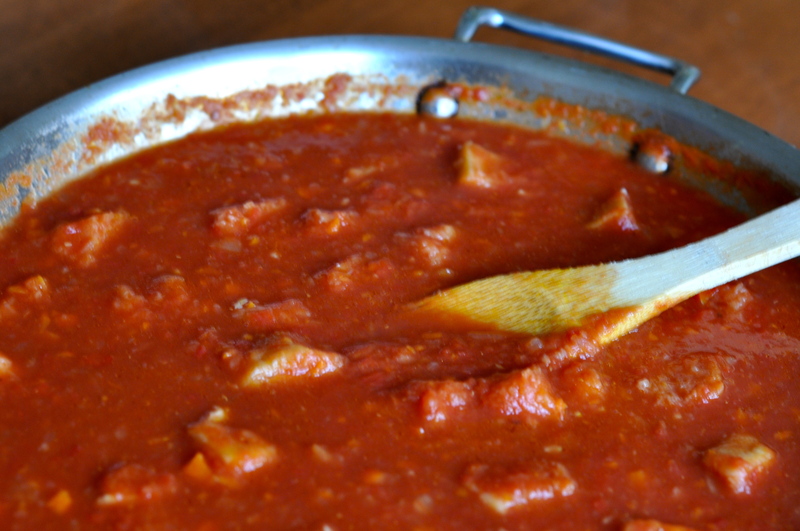 This classic rustic Tuscan tomato soup is called pappa al pomodoro in Italy. Bright, acidic tomatoes are combined with onions, garlic and basil, thickened with leftover bread and finished off with freshly grated parmigiano-reggiano. It smells heavenly and tastes even better. I’ve made this soup many times before, but just recently stumbled across a wonderful toasted bread and basil topping to sprinkle over the top. The topping adds another punch to an already great tasting soup. Thanks to Ina Garten – I am including the topping too. I’m just back from a glorious week in Tuscany. The weather was perfect. The wine sublime. The food rustic, simple and delicious. The villa stunning. All shared with cherished friends. About as close to perfect you can get this side of heaven. Oh…in case anyone is worried the tractor barreling down the lane toward us in this picture stopped just in time. No one was injured. Have you ever tried to photo-shop a tractor out?!? I’ve decided it adds some “interest” to our picture. 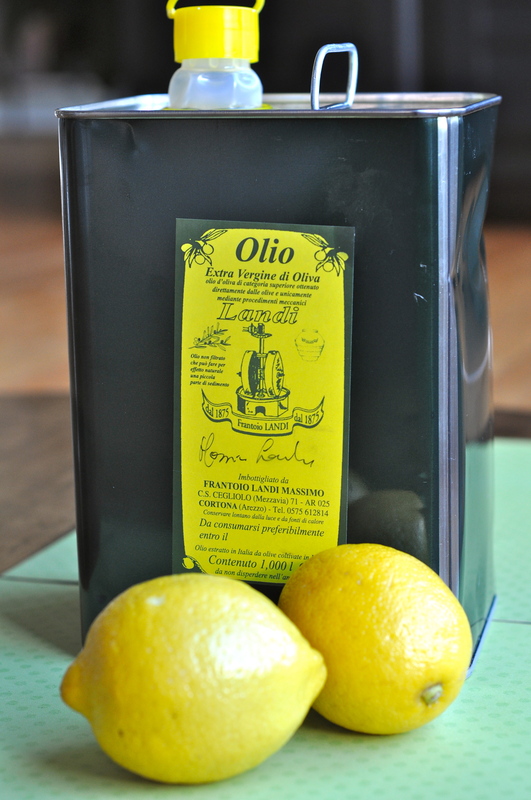 Two whole liters of cold pressed extra virgin olive oil bought straight from a charming and delightful heritage farmer. He let us wander through the grounds of his villa and olive grove. He proudly explained his organic growing methods and also the artisinal extraction approach he uses involving a centuries old stone wheel which produces hands down the best oil I’ve ever tasted. Liquid gold. A little tricky to get back to the states, but well worth it. 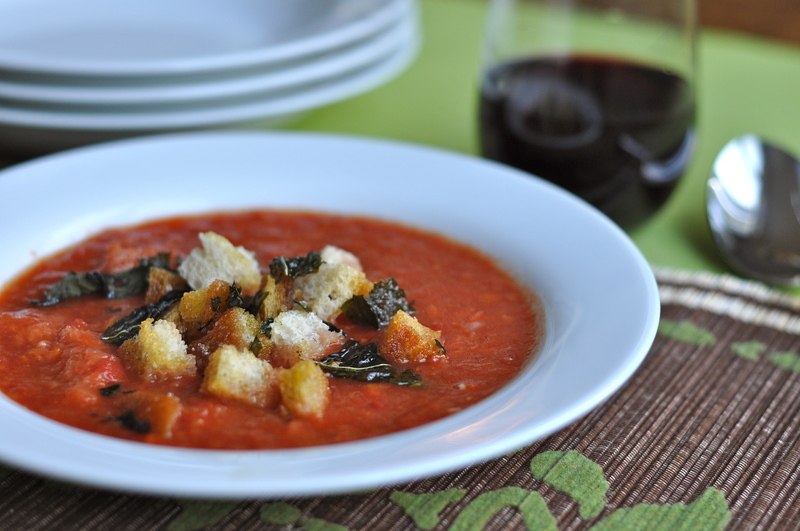 I used my newly acquired Italian olive oil to make this batch of soup….oh my it was good! 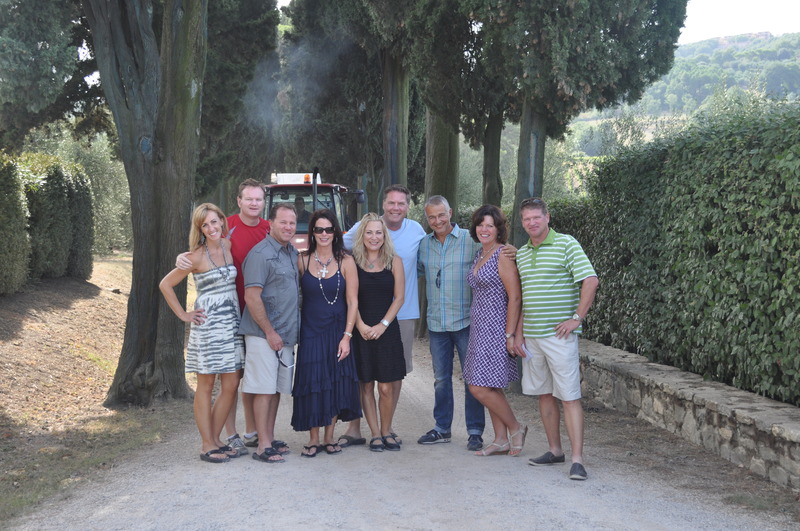 My post today celebrates all I love about Italy. 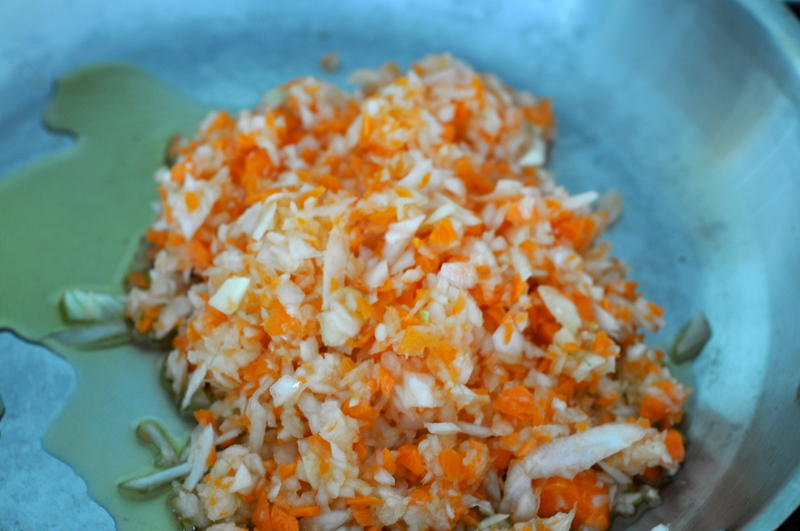 Simple food prepared using the freshest ingredients and shared with friends and family. Wines that compliment and match the flavors of the food. A little candlelight, a little laughter….perfect. 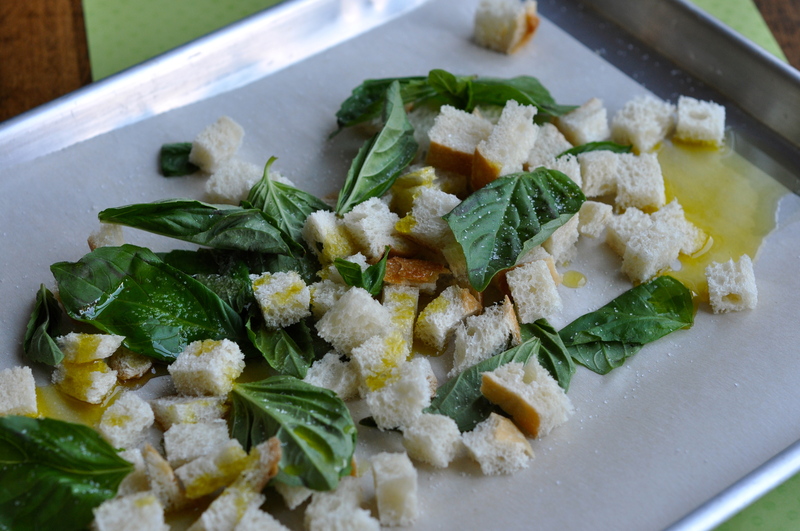 For the garnish toss two cups rustic Italian bread cubes with 10-15 fresh basil leaves and layer on a sheet pan. Drizzle with 3-4 TBSPS extra virgin olive oil. Sprinkle with coarse sea salt. Bake in a preheated 325 degree oven for 20 minutes. The basil will get dark but still tastes delicious. Set aside to sprinkle on the top of the soup right before you serve it. Meanwhile heat 1/4 cup of olive oil in a large pan. Saute the onions, carrots and garlic for about 10 minutes until tender. Add the other 2 cups diced Italian bread and saute for another 5 minutes. Add the crushed tomatoes, chicken stock and red wine. Salt and pepper to taste. Bring the soup to a boil, then reduce to a simmer and cook it for 30 minutes. Stir in freshly grated parmigiano reggiano and sprinkle the toasted bread crumb and basil mixture on top. 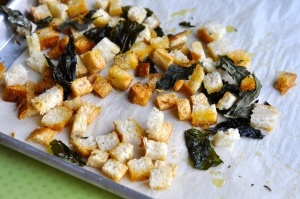 Toss two cups rustic Italian bread cubes with 10-15 fresh basil leaves and layer on a sheet pan. Drizzle with 3-4 TBSPS extra virgin olive oil. Sprinkle with coarse sea salt. Bake in a preheated 325 degree oven for 20 minutes. It will look like this when you pull it out. The basil will get dark but still tastes delicious. Set aside to sprinkle on the top of the soup right before you serve it. 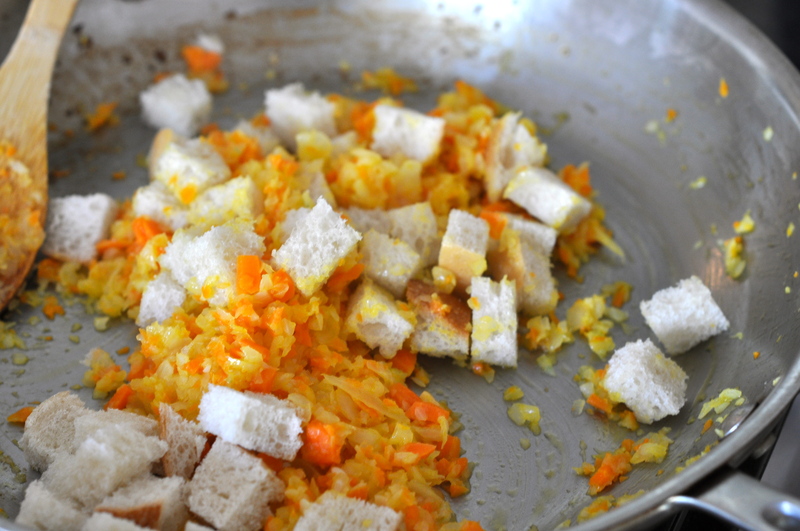 Add the 2 cups diced Italian bread and saute for another 5 minutes. I like the sounds of this! I follow a gluten free diet though so will have to ‘convert’ the recipe. Cathy – this looks amazing. I just printed out the recipe so Herb can make it this week. He isn’t traveling this week (for a change) and loves new recipes. I love your blog. Just wondering why you don’t have a Pinterest button. Might it come in the future?